If you need to get extra colour on top brush with extra butter and grill until the potato becomes crispy and golden.Take your time to fan the potatoes evenly over the filling and overlapped nicely, so the presentation looks great, this will also ensure they cook and crispen up evenly. Slice the potatoes into 3mm thick slices and place into the clarified butter making sure each slice is coated. Brown the venison over high heat, use a heavy based pan and cook in 2 or 3 batches, not overloading the pan. Remove and rest. In large pan add the oil then sweat the onion, garlic and bacon with no colour. Add in the cranberries and stock. Reduce over high heat by about half until thickened and rich in flavor stirring occasionally. 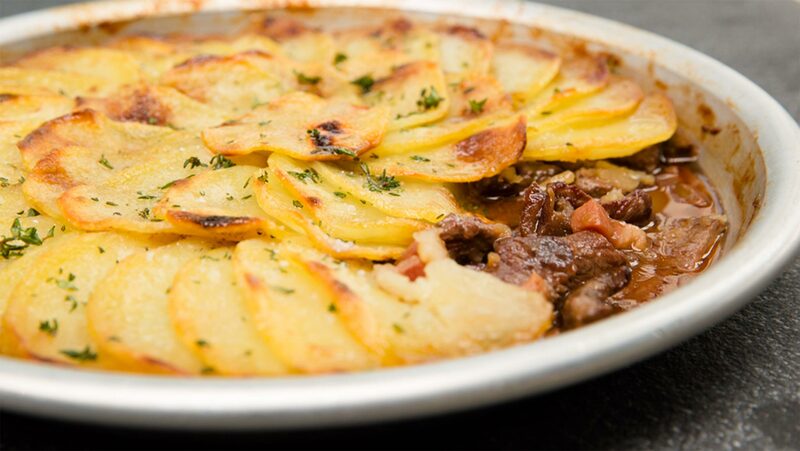 Season to taste with black pepper and add in the meat and fold together, place into a round baking dish and fan the sliced potatoes around the top. Bake at 180 degrees for 20 minutes covered with tin foil and then a further 25 minutes uncovered. The potato on the top should be crispy and golden.